11 days of peace. I found more 1/4″ poplar! I can’t remember why I have so much! 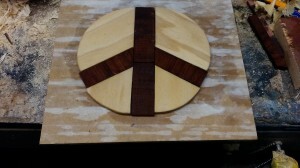 I cut out a small circle and lightly sanded the edges. I cut the circle in half and then cut a 30 degree wedge from each half circle. After making the cuts I arranged the 4 pieces so that the space between the wedges would form the shape of the peace sign. I wanted to add contrast and I had some old 1/4″ red cedar closet liner so I cut that into strips and filled the spaces with the cedar.